The sidewalk that Tetris built, originally uploaded by atari2600. I know the general rule of thumb is that geeks don’t like to get their hands dirty. However, occasionally I relish the chance to get out on the weekend and build, fix, or improve things around the ol’ homestead. 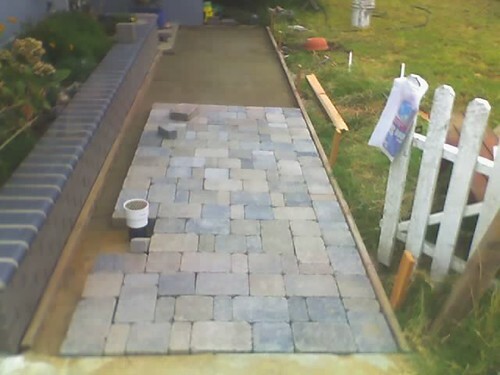 I took this picture this morning of a brick walkway I am putting in. While this was a ton of manual labor, I found that even in bricklaying, nerdiness has its place. I spent about 45 minutes in a zombie-like state while my mind processed the stack pattern involved in laying this pathway. I was trying to figure out how to arrange this pattern so that it would not require any side cuts (cutting the bricks with a wet saw). Additionally, the pallet that I bought contained three sizes of bricks all in equal numbers. To ensure that I didn’t end up running out of one of the sizes, I had to design my pattern so that it repeated and that it used the same amount of bricks in the various sizes.